He's also the 31st goaltender in NHL history and third in Blues history to record at least eight wins in his first 10 career starts. 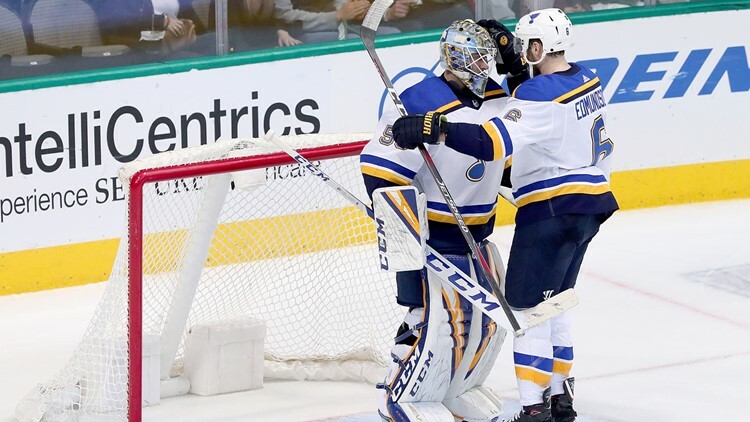 ST. LOUIS — There hasn’t been much difference between Blues goaltender Jordan Binnington and a brick wall recently. Binnington started last week with 22 saves in a 3-2 win over the Florida Panthers. He followed that with a 1-0 shutout, overtime thriller over the league’s leading offensive and the Tampa Bay Lightning. Binnington capped the week with 29 saves in a 3-2 win over the division-rival Nashville Predators. The 25-year-old leads the league with a 1.72 goals-against average for a minimum 10 minutes played. He was also named the ‘Second Star’ for the week of January 13. He's also just the 31st goaltender in NHL history and third in Blues history to record at least eight wins in his first 10 career starts. Binnington joins goaltenders Jake Allen and Brent Johnson in that category. The Blues have won their last six games, earning themselves the first wild-card spot in the Western Conference. Their streak started Jan. 23 in Anaheim and is currently the second-longest active streak in the league. Boston Bruins forward Patrice Bergeron and Chicago Blackhawks forward Dylan Strome were named second and third star for this past week.